So far in the book, we have demonstrated how the notion of problem learning can be incorporated into the design of search and optimization algorithms. It is the learned knowledge, expressed in arbitrary computational representations, that we refer to as memes. Thus, by augmenting a base optimizer with a memetics module (i.e., learning), it becomes possible for custom search behaviors to be tailored on the fly. Following on this, Part II of the book shed light on the fact that the impact of learned memes need not be restricted to a single task; presenting theories/methods for their adaptive transmission across problems/machines. Notably, the practical realization of such a system aligns well with modern-day technologies like the cloud and the Internet of Things (IoT) that offer large-scale data storage and seamless communication facilities. 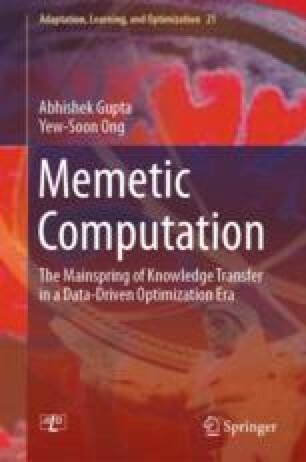 With the above in mind, the goal of this (final) chapter is to emphasize on a different implication of the afore-stated technologies that remains to be fully explored in the context of memetic computation. It is deemed that in addition to influencing the course of algorithm development, the widespread inter-linking of physical devices (driven by the IoT) will affect the nature of problems themselves. In particular, the combined space of possible solution configurations for inter-connected problems will naturally give rise to large-scale optimization scenarios that push the limits of existing optimizers. We contend that in such settings it makes sense to dissolve the existing distinction between the memetics module and the base optimizer, such that evolutionary processes can be directly carried over to a compressed meme space—in the spirit of universal Darwinism. Bonyadi, M. R., Michalewicz, Z., Neumann, F., & Wagner, M. (2016). Evolutionary computation for multicomponent problems: opportunities and future directions. arXiv preprint arXiv:1606.06818.